Android is the most used mobile platform in the world. It gets huge popularity because it is available for free, it is an open source operating system. It have a lot of applications and you can easily customize the operating system. Coming to the point, lets assume you want to create an android application but you don’t have coding knowledge about how to make android app. Don’t worry there are a lot of websites available on internet to create android apps without any coding knowledge. Here I list out some websites which offer free android app creation. Try these online services to built your own android applications. 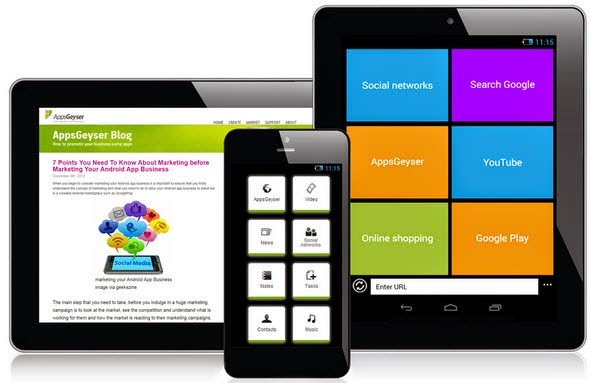 AppsGeyser provides so many types of applications for free. You can create any application which are listed on their website. They have different types of categories like website, browser, EBook, Zip archive, News, Wallpaper etc. There is no need of code to do this application. You need to create one free account from this website and select the application type. After choosing application type you will need to enter the details of applications like app name, screen size, description about application etc. After filling all details click on create app button. After this process you can download your application in apk format. You can also monetize your application by applying for monetization process in the website. Once you apply they will review your application and send mail to you about monetization status. There is no need of coding ability. Use HTML 5 to add enhanced features which improves application stability. Appypie is another great website to create free android apps without having any programming language. It also offer a wide range of application categories. You can create android application easily from this website by using simple drag and drop feature. Now just add some other features like about page, contact page by clicking on the + symbol. Once you complete all the fields click on “save and continue” button. After that you can download your android application. There is no coding required and just use drag and drop feature. Earn money with placing ads on application. Number of application categories are available. There are some more free android app creation websites but these two are most popular with so many features. I have a online shop and I ahve already have a website too. However now I want to create a mobile app for it, This is my website : magento certification, could you give me some advice?